One of my coworkers has about 6 cars but usually weather permitting rides his motorcycle. I knew he also had a suicide door Lincoln but a few weeks back he showed up in this. Its the two door 6 cylinder version and he has slightly oversize rims on it. I think he said he is the third owner. Not a full on Donk but a nice clean cruiser, remarkably rust free. 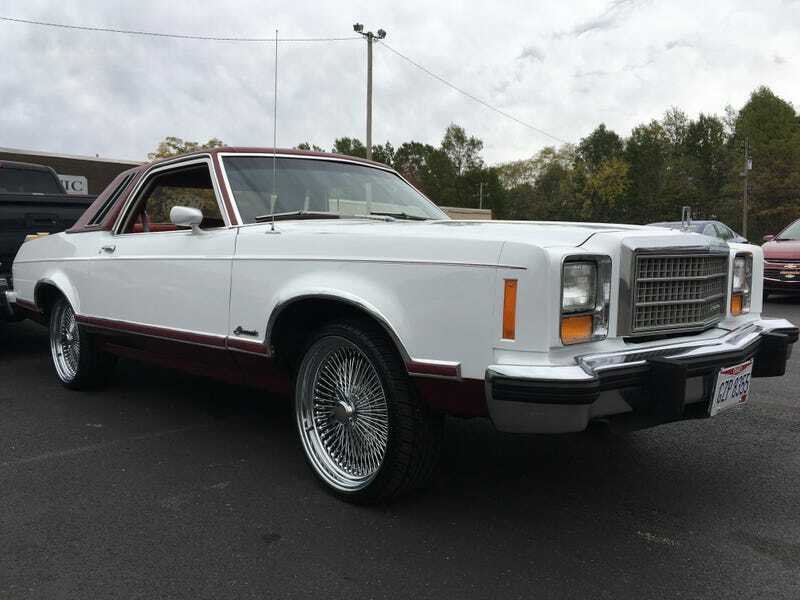 It caught my eye because I had owned its stable mate a 1976 black 4 door Mercury Monarch Ghia with a 302 Windsor, 4 wheel disc brakes and factory alloy wheels back in 1977-79. What was amusing was my 302 was a bit faster than one of my friends 1977 Camaro RS with a 305 at the time. I made the Merc handle better by swapping the shocks to HD gas ones plus switched to BFG T/A tires when I removed the ill-fated Firestone 500's, all while my car only had 18k miles. It transformed the car handling wise into something you could sling around instead of just floating along. What had been near dangerous on a curve was all of a sudden a pleasure to drive. I had owned a Triumph, Gremlin, Saab and Fiat prior to the Mercury so I’d wanted it to be more nimble like the smaller cars and the changes worked. Being based on the Falcon chassis much like the Mustang there was actually a lot you could do to these cars but I never got the chance for more mods before I needed to trade mine. My sister used the car for a year while I was in Texas working offshore and she beat the car to death. I had to do a valve job, brakes, suspension work and get tires again after she had driven it for only 22k miles. It had under 60k when I finally traded it and got a Mk1 Fiesta. I’ll have to see if I can drive my coworkers Granada. Not much he will ever do to it being its a six cylinder but I’d be tempted to do a cam and exhaust. I had to post this little article because Richards car is so OPPO. Hopefully I can get a picture of his big Lincoln next year.